Smyth was born in Ballyhooly Co. Cork. He was the last Union General to be killed in the Civil War. He died on the day of Lee’s surrender at Appomattox, having been mortally wounded by a sniper two days previously. He fought at Antietam, Fredericksburg, Chancellorsville, and was a Brigade Commander at Gettysburg. . 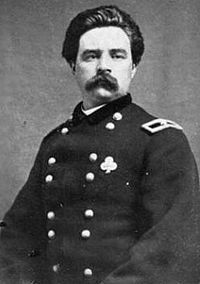 Following his death, he was posthumously brevetted Major General, US Volunteers. A truce occurs when British and German troops layed down their arms and played a game of soccer between the trenches. It is a day full of myth and legend, poorly recorded (partly due to the commanders of both sides playing down the event) and probably some exaggeration as to how large an event it was. There is no doubt that Silent Night was sung by both sides on the night. The Dept. of the Taoiseach states that some “Some Irish soldiers took part in the Christmas Truce of 1914 when there was a spontaneous cessation in the killing for a short period.” There is little record of Irish troops being involved, but given that over 200,000 Irish fought in the British army during this conflict (over 30,000 killed), it is quite likely that some Irish brogues were heard during one of the most poignant incidents in military history.